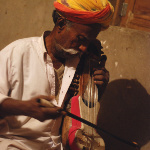 Lakha Khan, 63 is a sarangi player and vocalist, and perhaps the greatest exponent of the sindhi sarangi. He was born in the village of Raneri in Jodhpur district, Rajasthan, India into a family of traditional musicians from the Manganiyar community. He was trained at an early age by his father Tharu Khan and later, by his uncle Mohammad Khan, in rendering the compositions of the Multan school of Manganiyars. His first public performances were in the late 60's and 70's under the guidance of the late Komal Kothari, a highly regarded Indian historian and ethnomusicologist. 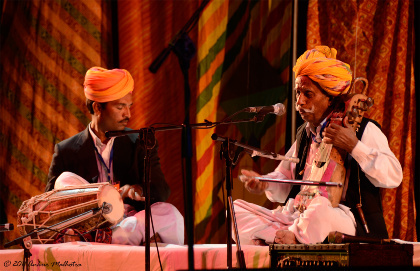 Today, Lakha Khan is one of the last remaining Manganiyars to have mastered this complex instrument and to carry forward the centuries-old musical tradition of Rajasthani folk and Sufi music. 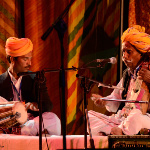 He has performed extensively across Rajasthan and India, and internationally in the U.S. and Europe. In 2011, he performed at the Edinburgh Folk Music Festival and The Amarrass Desert Music Festival. "In the master's hand, the Sufi-influenced melody he coaxes from it (the sarangi) is transformative" - Michael Sullivan on National Public Radio (NPR) Weekend Edition. 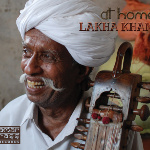 A living legend, Lakha Khan is not only a virtuoso on the sarangi, he sings fluently in Sindhi, Punjabi, Hindi, Marwari and a variety of dialects, his knowledge and skill spanning the divide between folk and classical music. He confesses "classical always remains in control while we, who have learnt on our own, take liberties. At times we go out of tune but at times we discover something new as well."